In my book, the best thing to do in Penang! The most prominent landmark (and must-see) is the Cheong Fatt Tze Mansion. 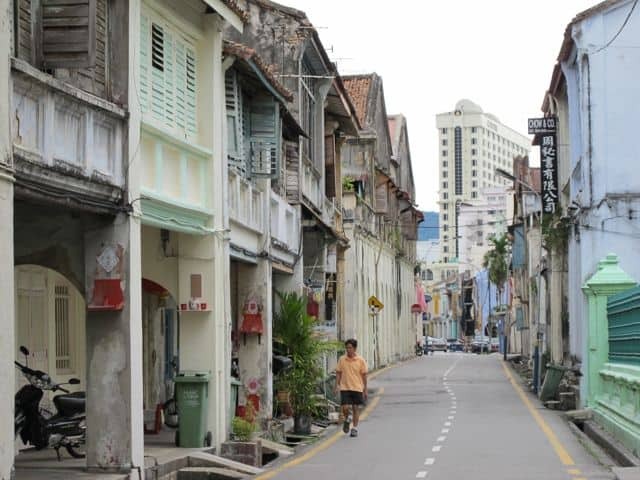 However, the neighbourhoods surrounding Jalan Penang (Penang Road) and Lebuh Chulia (Chulia Street) are packed with gorgeous colonial and Chinese heritage buildings as well as wonderfully atmospheric temples and narrow streets. You can follow the Heritage Trail in George Town which takes visitors past the most famous landmarks (this route is marked on most George Town maps) or you can wander around the historic centre of George Town and spot the Heritage Trail info boards. A great thing to do in Georgetown is a stroll around the historic city centre. Check out the Penang Peranakan Mansion, Little India along Lebuh Pasar (Market Street), Khoo Kongsi Clan House, Kuan Yin Temple (Penang’s oldest temple), Teochew Temple, Hainan Temple, Kapitan Keling Mosque, Sri Mariamman Temple and the beautifully restored heritage shophouses of the Straits Collection on Stewart Lane. Another gorgeous stretch of heritage villas can be found along Lorong Bangkok (Bangkok Lane) in the nearby neighbourhood of Pulau Tikus. Hop on a rickshaw anywhere within the historic core of George Town for a unique and fun tour. Penang’s many culinary highlights attract visitors from all over the world. One of my favourite things to do in Penang is street-stall hopping! There’s just so much to discover, from my absolute favourites Penang Char Kuey Teow and Penang Laksa , to Nasi Kandar, Mee Rebus, Hokkien Mee, oyster omelettes and spicy southern Indian curries. You’ll soon discover that Penang is a culinary gem! Most visitors head to Penang’s famous Gurney Drive (a beautiful seafront boulevard with many restaurants, cafés and hotels) to kick off their culinary adventure. For a quick introduction to some of the best dishes that Penang has to offer, I recommend a visit to the New World Park food court. I can also recommend Sin Hwa coffeshop (329, Jalan Burma), and Joo Hooi Cafe (475, Jalan Penang) for deliciously authentic Char Kuey Teow and Penang Laksa. Alternatively, you could book a Penang Street Food Tour or even better, join a Penang Cooking Course! Established in 1986, the Penang Butterfly Farm is one of the world’s largest and is currently home to more than 4,000 Malaysian butterflies of 120 species. Wandering around the aviary with hundreds of colourful butterflies fluttering around is simply an enchanting experience. 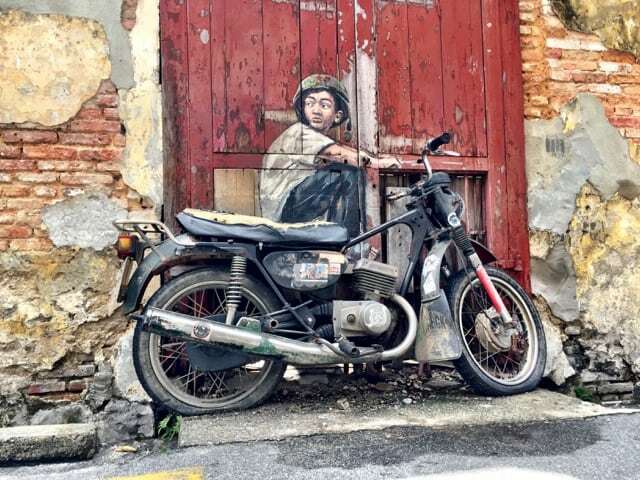 There’s a lot of very cool street art scattered across Penang, especially in George Town. ‘Hunting’ for street art in George Town is a great way to explore the city. There’s a famous collection by Lithuanian artist, Ernest Zacharevic, which I call ‘3D street art’ (you’ll soon see why), as well as artwork by local artists. One of the ‘3D’ pieces by Ernest Zacharevic. 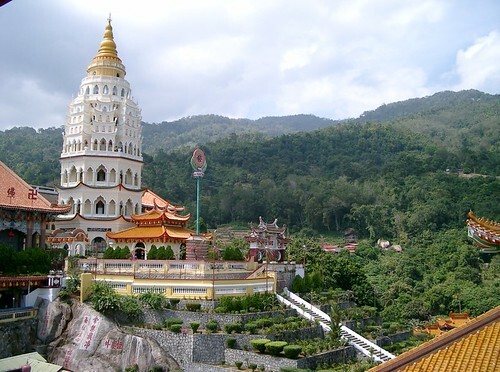 Better known as Kek Lok Si, this is the largest Buddhist temple in Southeast Asia and stands tall on the hills of Ayer Hitam. This elaborate complex consists of a series of monasteries, prayer halls and beautifully landscaped gardens. The main attractions of the complex include the Pagoda of Rama VI, the Liberation Pond and the towering statue of the Goddess Kuan Yin. 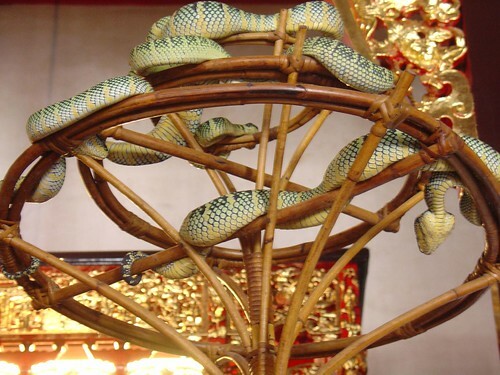 Perhaps the only one of its kind in the world, the Snake Temple is a Buddhist temple with a population of resident pit vipers (the poisonous variety). It is believed that the snakes made the temple their sanctuary as development in the surrounding hills destroyed their habitat. The wardens say that the constant smoke from burning incense renders the snakes harmless, making them a great photo opportunity! At an elevation of 800+ meters, Penang Hill (or ‘Bukit Bendera’) is a popular retreat for the locals who come up here to enjoy the cooler climate and the stunning views of George Town. There are several ways to ascend the hill: a funicular railway (by far the most popular method), a jeep track and hiking trails. The original funicular railway (which dates from the early 1900’s) has recently made way for brand new trains from Switzerland. 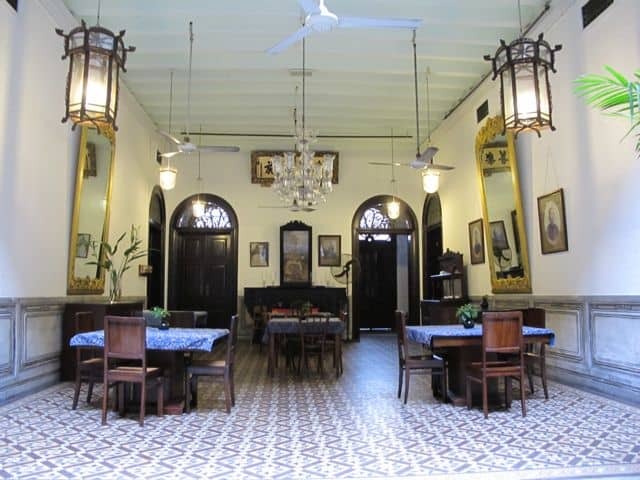 A stay in Penang wouldn’t be complete without a visit to one of the beautifully-restored heritage buildings. The most famous venue for an afternoon high tea, complete with piping hot scones, is the Eastern & Oriental (E&O) Hotel. You can also drop by the hotel’s pub for a pint – famous people who’ve been here include Noel Coward, Somerset Maugham, Rudyard Kipling and Charlie Chaplin! A short walk up the road is The Mansion, another stunning heritage building. There’s a lovely restaurant as well as a lounge and bar in the gardens with beautiful views of Penang harbour. Just outside George Town and surrounded by gorgeous, ancient-looking trees, is Suffolk House, a mansion built on the site of the former residence of Sir Francis Light, the founder of the British settlement in Penang in the 18th century. You can have a meal at the restaurant or take a tour of the stately mansion. 10. 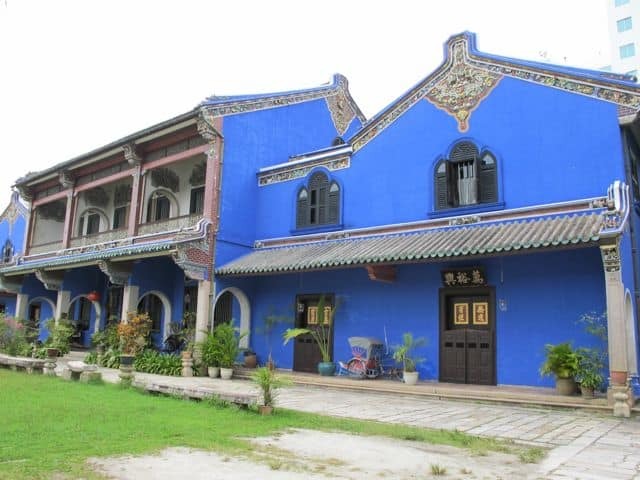 Even better, stay in one of Penang’s heritage buildings! Quite a few of Penang’s heritage buildings have been converted into gorgeous, atmospheric boutique hotels. Staying at one of these heritage boutique hotels is a great way to immerse yourself in the island’s history and culture. Some boutique hotels I can recommend include Seven Terraces, Jawi Peranakan Mansion, 23 Love Lane, Cheong Fatt Tze Mansion and Macalister Mansion. The dining room at the Cheong Fatt Tze Mansion. Read about a weekend in Melaka and my impressions of Melaka, Malaysia’s other UNESCO World Heritage listed city. Thank you Steve for your informative comment. Love what they’ve done to restore Suffolk House. I’ve adjusted the text to reflect that the mansion was built on the site of the former residence of Sir Francis Light. Thanks for the heads up! Suffolk House was built in 1805 on the site of Francis Light’s original house. The house is of interest as being where it is and as an example of early British Colonial architecture. You’re welcome Martin! 🙂 Enjoy Penang! Tks I know more about penang, I will go to the places that you suggested. By the way thanks. I am planning my trip from singapore working my way up to thailand. The places you’ve recommended to go to made me change my mind to spend more time in Penang. Great list of things to do and see in Penang!! I particularly love the mixture of architecture and the food looks absolutely amazing! Very informative post. Thanks! Traveling to the Georgetown Art and music festival this weekend for a good five days. Will check out everything recommended! Can’t wait! Just arrived in Penang this evening and have already scoped out the bakery you recommend! I look forward to working my way through most of the items in this list – seriously can’t wait to start trying all the delicious food! Yes, there are, especially in Little India. In any case, there are always vegetarian options available in Malaysia. Simply ask. it is all amazing,eagar to visit penang, are there some vegetarian (no fish,no egg even)food joints here? Very informative post! Thanks for the insight into Penang! Your suggestions are a great starting point. Thank you for all the great info on Penang! We are there right now and can’t wait to explore around and dig into some laksa! I went to Penang for the first time ever last year. We did Fort Corn Wallice, The was Museum, and the Toy Museum. I went with my family. We also went to the snake museum.. I am pretrofied of snakes but our driver told us they were all behind glass, I sooned learned they werent. I took once step into the entrance and bolted the other way balling my eyes out. All the locals thought it was funny. We went to Komtar and Queensbay Mall. I highly recomend Komtar. We also walked around Georgetown, went to the Butterfly Farm and Toy Museum (I have never seen so many toys in my life). I went horse riding along the beach in Batu Ferringhi which was great fun. Is there anything new that My family and I are can do as we are going to Penang and KL in April? Haha, they’re actually pretty harmless. Thanks for your comment Jonny! Those vipers look so scary, I bet there are so many people like me that would go there and not last 2 minutes without running out the door. 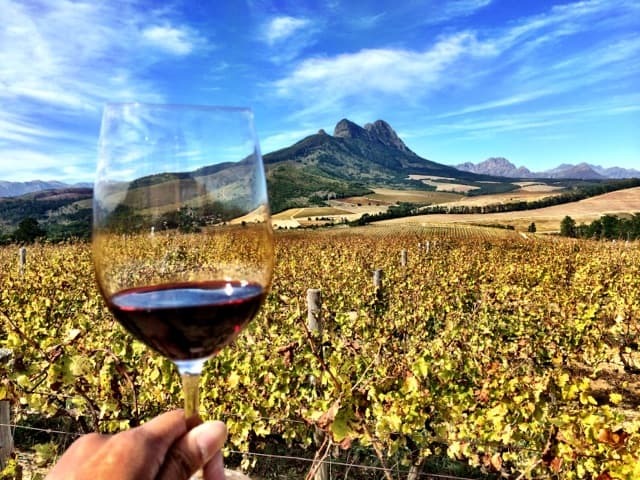 Great comprehensive post! Penang is about a 5-hour drive from KL, past lovely places like Cameron Highlands, Pangkor Laut island, Ipoh and Kuala Kangsar. Alternatively, you can fly; it’s a 30-min flight. If you’re an architecture/history junkie, I highly recommend Georgetown. You’ll love it! Well timed post, Keith — I’m headed to Malaysia next week to spend a few weeks. I’ve visited Penang already, but this post has made me consider a return visit. Looking forward to checking out some of these, and your KL recommends. As an architecture junkie, Georgetown looks like a great place to walk around! I’ll be in Malaysia for a week in October. How far is Penang from KL? Thanks for this article, Keith. I remember stumbling upon one of your “10 things to Do in…” (some SEA city) about a year ago before I moved to Asia! I still have a vague visual impression of the article bc the pics were stunning & I thot your list would be a nice rough guide to take. Malaysia is now one of the countries on my bucket list, so thanks for saving some of the Lonely Planet reads!